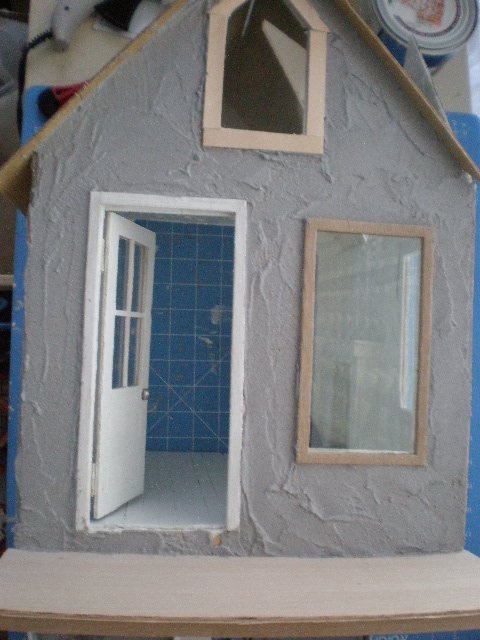 I have started the exterior finish of the house. I'm using concrete on the exterior. 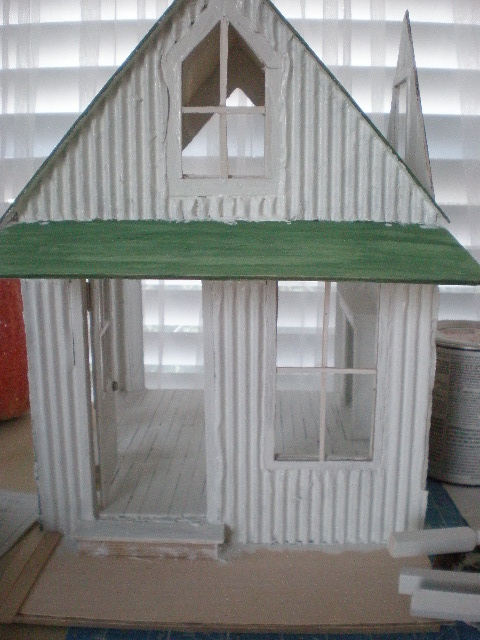 This makes the dollhouses very strong and shipping worthy. If I weren't shipping I would skip this step. While the concrete is still wet I apply the wainscoting. This is a cardboard box that I stripped the top layer off of to reveal the ridges. Now I have a super strong bond between the house wood, concrete and wainscoting. 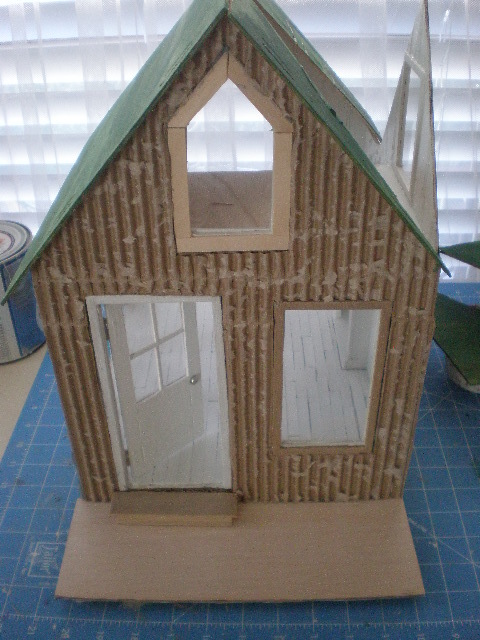 I also added the porch floor and the little front door step. 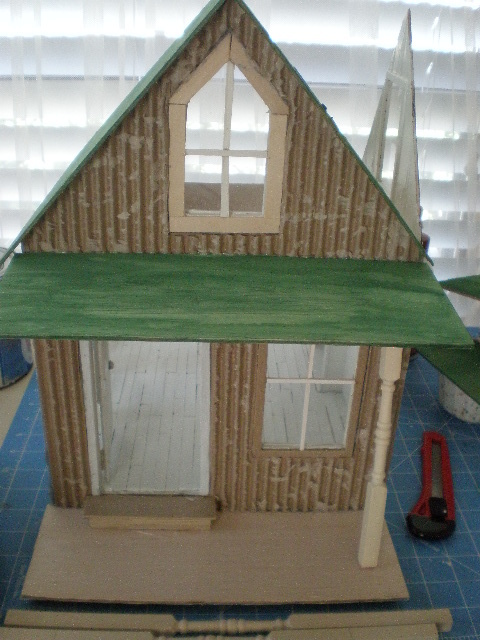 I painted the roof green so that when I add the shingles no unfinished wood will show through. Starting to look like something you've seen before? LOL! This one too is so interesting! I love how you use the cardboard! You always amaze me and inspire me! I repeat words from Terri : You always amaze me and inspire me! With the support of your perfect examples, I started a new construction project! No more ready-made boxes, collecting the wall by myself! I'm afraid, but look at your work and do it. My motto now: Remember Caroline, and just do it! I love your dollhouses and I really love coming to your blog you are sooo creative. I agree with Terri...I love how you use the cardboard. That look is amazing! I LOVE your shabbby streamside studios, Caroline! This is looking so lovely! What a stunning idea Caroline, using the cardboard. It looks great ( like all your houses), and what a good idea to paint the roof before adding the shingles. And YES you ''pestering woman'' :). I did the voting again today, so I think your sister is going to win ! !